I told you the other day that my word for 2014 is INTENTIONAL. Being intentional is not something that comes easy. It is something that has to be practiced and worked on daily. In order to become an intentional person I must discover what I want without worrying about the how first. This takes a lot of self-questioning. I started off by making a list of all the things that bother me in my life. Some things on my list were fairly big things and other things were small. Now that I had a list of things that needed to change to make me a happier person it felt good. I didn't even realize how many small things were causing me frustration. These things were causing me unhappiness and they could easily be fixed! Dr. Randy Carlson says, intentional living happens when you combine information, insight, and action. I've been using a free app call Any.Do to write down a to do list. You can write tasks for today, tomorrow, upcoming, or someday. You can also create folders so I have personal, work, and blogging. I like that I can write tasks for someday because I can keep up with ideas of things I want to do but I don't have time for in the moment. You are also able to move tasks from each category. Whatever I don't do today I just move to tomorrow. I'll be sure to keep you all updated as I work toward being more intentional. 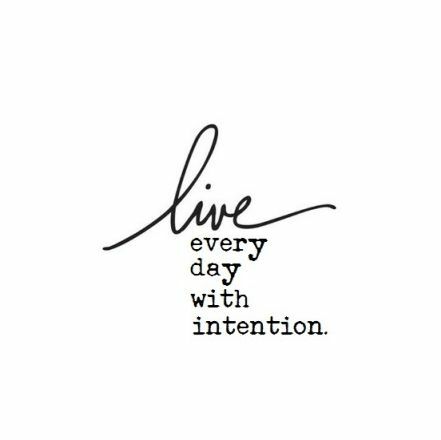 I, too, am working toward an intentional life! I found a great book and some other resources that I am sharing on my new blog Itsbellasbedtime.blogspot.com. We could encourage each other! Best wishes on your journey to intention!! I love that this is your word of the year. It's such a fantastic goal, and can only make you feel better, I think. What a great word, and a great goal!